The Hoont Bug Zapper features a high intensity ultraviolet bulb that attracts all pesky flying insects into the device. Insects then make contact with an extremely powerful high voltage electrically charged metal grid, instantly killing them. Kills a limitless amount of insects. Get rid of all flying insects and bugs! Designed to spread light in all four directions, thus being effective for a large area of up to 600 sq. feet! Perfect for home, office, kitchens, restaurants, schools, hospitals, etc. or for commercial and industrial use. Protects and prevents against annoying and disease carrying flies and insects! Features a detachable ring, designed for hanging high-up to keep out-of-reach of children and pets, or can be free standing. Dead insects get collected at the tray at bottom of unit, which can then be easily removed for cleaning and bug disposal. Safe to operate 24/7. Non-clogging and easy to clean electric grid. PESTICIDE, CHEMICAL & ODOR FREE - Get rid of all flying insects and bugs without the use of pesticides or dangerous chemicals. Maintenance free and easy to use; simply plug in the bug zapper and watch the device eliminate all pesky and annoying flies by electrocuting them in the metal grid. 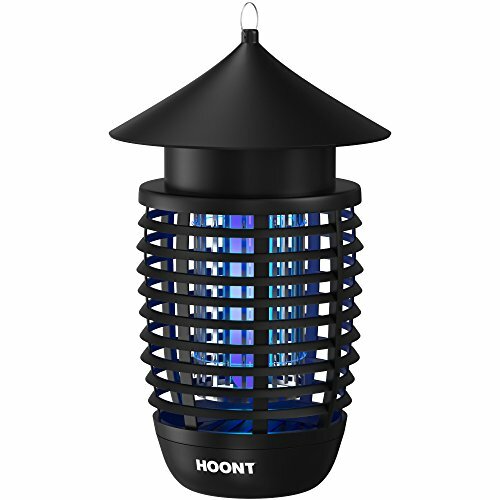 POWERFUL FLY & INSECT CONTROL - The Hoont Bug Zapper features a high intensity ultraviolet bulb that attracts all pesky flying insects into the device. Insects then make contact with an extremely powerful high voltage electrically charged metal grid, instantly killing them. Kills a limitless amount of insects. Get rid of all flying insects and bugs! CLEAN & SAFE - Features a detachable ring, designed for hanging high-up to keep out-of-reach of children and pets, or can be free standing. Dead insects get collected at the tray at bottom of unit, which can then be easily removed for cleaning and bug disposal. Safe to operate 24/7. Non-clogging and easy to clean electric grid. EFFECTIVE & LARGE AREA COVERAGE - Designed to spread light in all four directions, thus being effective for a large area of up to 600 sq. feet! Perfect for home, office, kitchens, restaurants, schools, hospitals, etc. or for commercial and industrial use. Protects and prevents against annoying and disease carrying flies and insects! SPECIFICATIONS For indoor use, or outdoors where unit will stay dry. / Power: 7 Watts / Size: 10" x 6" / Cord Length: 5 ft. / Bulbs: 1 High-intensity UV bulb (replaceable) / Upgraded for top performance. If you have any questions about this product by Hoont, contact us by completing and submitting the form below. If you are looking for a specif part number, please include it with your message.